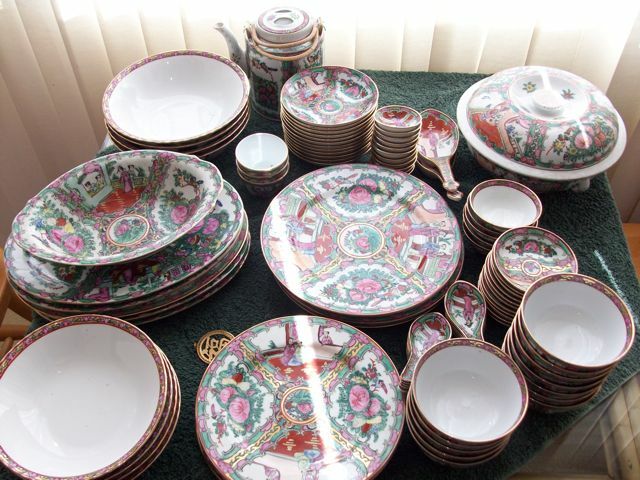 I have an 89 set of china that was donated to me for a fundraiser I am doing. I have no idea what it is worth. I believe that it is rose medallion. Some are stamped with chinese characters on the bottom, some are not. A few have "ACF hand decorated in HOng Kong" They all all four divides that alternate with pink flowers and people, usually in twos some people are peeking in through windows. They are all gold trimmed. I posted them on craiglist and a chinese women responded that she would take them all for $50 and that was a lot since "the newspapers say to throw all China in the trash" I think I was almost swindled! Can someone please help me? It is for a very good cause. I described them to an appraiser over the phone and he said at least $300-500 and maybe more depending on the date they were made. Here are some photos. I really appreciate any help. Mahalo! You're 'Canton' porcelain is modern and purely decorative. I think ACF is the name of the company in Hong Kong who produce it. I see pieces around the antique fairs (for some reason) and they sell for a few pounds so I guess just on the quantity they must be worth around $100 or so! You're appraiser probably thinks they're early pieces. 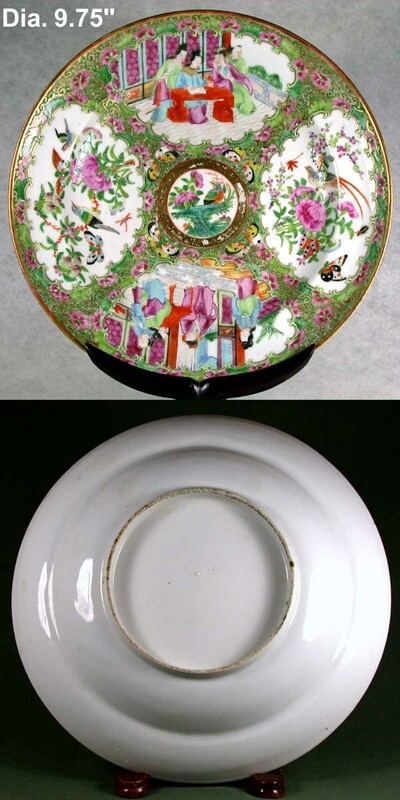 Everything showing in your photo looks to be consistent with the 'rose medallion' motif, as painted and refired on porcelain blanks from Japan and China about the third quarter of the 20th century or later in various Hong Kong factories. I believe there may be some examples of this pattern in circulation that were painted before 1950 in Hong Kong. A number of Mainland China factories, I believe including some that still produce these dishes, relocated there to escape the civil and subsequent world war. However, your dishes appear to be virtually new and therefore lacking in true value to antique collectors. This is not to say that there is no decorative value to your set. I've included a link below to a popular web mall with current examples of what dealers are asking for these wares, sometimes optimistically I think, If you will query the site's search feature with keywords 'rose medallion', you'll find other representative pieces, which may help you flesh out values for yours. You also might wish to search eBay for a reality check on actual prices of recently sold examples. Is late 20th century dinnerware painted in style began popular Chinese export porcelain in 19th century. For pricing estimate go to department store, look at porcelain dinnerware sets around 100 or more pieces, pick middle price range, divide in half, then make personal estimate how complete yours is: how many cups survive, how many each type of dish? Assign percentage (such as 75%) multiply by the half of new dinnerware set price. That would be probably highest amount you could expect since not many want dinnerware that is missing many most-used pieces. Since is nowhere near antique, has use-value not 'collectible' value. Indeed rose medallion it is. This pattern has been made from, lets say, mid 19th. century till.... now I think. The older and (much) better decorated ones getting higher and higher in prices the last few years (in Holland).If your set was from 19th. century I think it could do much more than 500. (1000/2000 ...) But... the Hong Kong ACF mark points to a late 20th. ct. dating (around 1970) and this ware only have a decorative value. thanks everyone. They all seem to be in good condition as the woman who donated it said that she never used them. On some of the plates, the paint is wearing. Actually, it is just two of the plates that say ACF decorated in Hong Kong. The rest are blank or have a stamp with Chinese characters. Does this change anything? Chinese character marks also are applied in Hong Kong. I've seen some alleged exceptions to the rule, but generally all rose medallion produced before 1890 is unmarked, and anything after that time that interests collectors isn't marked in Chinese. However, I've seen some armorial rose medallion dishes with the family crest on the base. For reference, here is what a fairly good quality rose medallion dish from circa 1875 should look like. The company that marketed the full set could have had different sources for the components. It would have been sold boxed, labeled with name of company and 'country of origin' just in case it was to be exported. World economy nothing new. Archaeological finds in China include glass vessels made thousands of miles away around year 500 CE. Overglaze iron-oxide pigments (orangey-red) are usually first to wear off since not fuse well to porcelain like more glassy enamels. Yes, the one you posted has better detail. Here are photos of a few that are marked some that are not. I also have a set of later Rose Medallion service for 12 with a chinese character on the back. Are these considered for decorative use because they are unsafe to eat on? Is the glaze or paint particularly toxic? I was planning to use these for eating unless they are unsafe for this use.